При запуске программы ее значок помещается в системный трэй и вся информация отображается либо на маленькой пиктограмме, либо во всплывающей подсказке, выводимой при наведении мышки на значок MemInfo. MemInfo Displays the current memory (RAM or Page File) usage of Windows in the system tray. With a small gauge graphic and the value updated in real time, MemInfo gives a fast feedback to current memory usage in Windows. 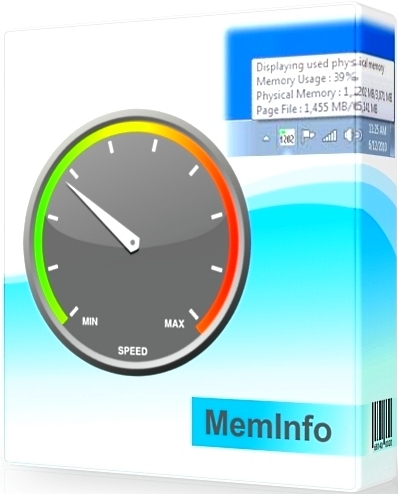 MemInfo is highly customizable; Choose when MemInfo should warn you about high memory usage, show physical memory or Windows page file, show free or used memory, choose the font that looks better. MemInfo cames with a built in memory defragmenter to allow speed up your computer by maximizing the available free memory.